Before the year ends, I want to send you merry wishes for the new year. I chose Fehu to represent these wishes, because of the perspective it holds. Fehu is the cow Rune. In times long past, cows represented wealth. Today, we have a great tendency to interchange the idea of wealth with money without making an important distinction. They are not the same thing. Money is money. It is designed to be a tool used for the exchange of goods and services. Money is also a form of wealth, but wealth is not purely money. Wealth can be a whole variety of things as evidenced by Fehu, the cow. Each one of us defines what wealth is to us. It can be a roof over our head, a vehicle...a whole myriad of objects; but it can also be a friend, a pet or our family. Perhaps it's a job or a skill, a hobby or a walk in the woods or on the beach. It can be our health or something as simple as a smile. However you define wealth, Fehu serves as a reminder of that wealth in our lives. Take some time, before 2017 melts away, to sit with Fehu to ponder the wealth in your life and to recognize and appreciate what you have. Let that carry you into the new year, not only providing a foundation for you you, but let it guide you peacefully to the wealth you still seek. And, thank you for being a part of the wealth in my life. 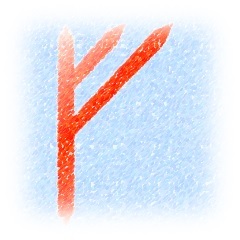 I am grateful for everyone who reads my blog and engages with the Runes. Happy 2018! Thank you. As a reminder and a blessing.